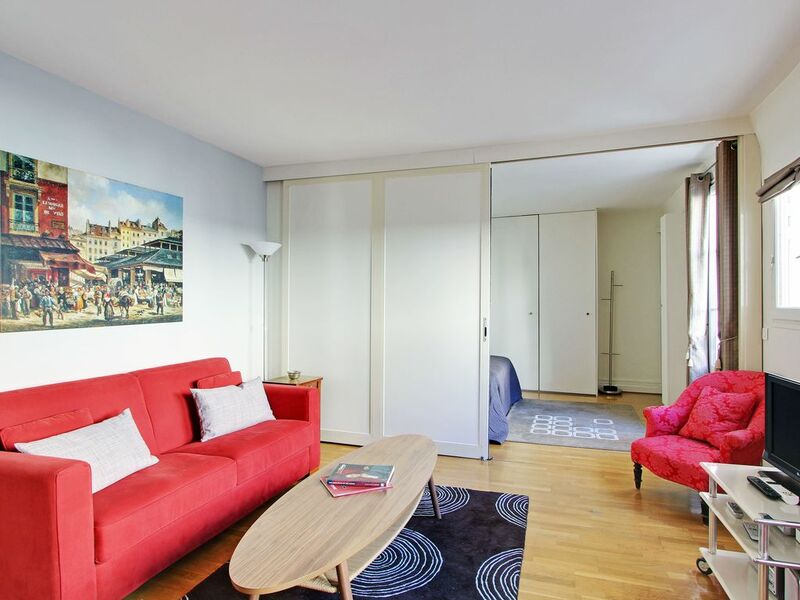 On the edge of the Marais and just next to rue Montorgueil, this spacious apartment is tucked back into the courtyard of a quiet building on a tranquil street in the 2nd Arrondissement. The flat is overlooking zinc roof-tops and sky. The result of this is a virtually silent space, free from the street noise of surrounding Paris. This 60 square metre flat is organized to have 2 separate sleeping areas, making it a 2 bedroom flat. Upon entering, the guest enters into an entry lounge, containing two single beds and a wall of cupboards for storing clothing and luggage. This first room is separated from the double living area by a large sliding door - when open, the spaces are joined to make a large, sunny, loft-like space, and when closed, the entry becomes a quiet separate room for reading or sleeping. We can provide a third single fold out bed here too. The double living and dining area runs the length of the apartment and is illuminated by a wall of windows on one side. The first lounge area is furnished with a sofabed that is quick to open and has a very thick mattress, two luxurious Napoleon-style armchairs, and TV, DVD, and wireless high-speed internet. The dining area contains an expandable dining table surrounded by comfortable leather dining chairs, and can seat 10 if the desire for hosting a large dinner party takes hold. There is also another seated area with a large leather sofabed making it comfortable to sit in different parts of the apartment to read or chat. Proceeding through the apartment, the quirky nature of Marais apartments is revealed by a series of doorways and stairs. Many of the apartments in this area are recuperated from several different spaces in very old buildings and thick, crooked walls, myriad steps up and down, and tilting floors are the norm. Back in the main level of the apartment, a step down from the dining area takes you to the newly refurbished kitchen. It is fully equipped with large refrigerator, 4 burner induction range and oven, clothes washer/dryer, dishwasher, microwave, electric kettle, coffee pot, and more amenities. The corridor, accessed by a step down from the dining area, leads first to a large bathroom with double sink vanity, toilet and walk in shower, and then to the main bedroom. The Montorgueil district is centered around rue Montorgueil, a primarily pedestrian street which is a 'rue des commercants' - or shopping street par excellence. Restaurants and cafes abound, as well as the scores of boutiques in the surrounding streets. The area has in recent years become a haven for young designers and this is evident in the small boutiques scattered throughout, but the larger clothing stores still remain as well, centered around rue Etienne Marcel, which runs toward Place des Victoires, a 5 minute walk away. The Louvre museum can easily be reached on foot. Closest metros are Reaumur Sebastopol and Etienne Marcel, line 4 and 3. Location, space, quiet yet close to everything. Appartment was large and very comfortable! Loved this place! Clean, quiet, and close to everything. We r a family of 5 and loved the space. We go to Paris about every other year and this place for us has been the best. For the future we will always try to stay here first. Great location and quiet apartment. We really enjoyed our stay here. The location to things was perfect and we certainly felt safe in the area. We had 6 people in the apartment and it didn’t feel to crammed. The red couch in the living room is surprisingly comfortable. They just updated the bath and kitchen which are beautiful but they got rid of the bathtub so that was disappointing since we had 3 toddlers and was one of our main must haves. The shower felt clean but it was impossible to now get water on the floor. That whole bathroom felt very wet and the fan was sub par. The floors in the bedroom are very old and somewhat hazardous. They will pinch your bare feet and my son actually tripped and stubbed his toe on one of the boards. There was no broom just a vacuum that did have the best suction so it was real difficult to keep the floors clean. There were two different Locked entry doors before you get to your apartment that also is a locked door. That was a very settling feeling. Close to great restaurants and groceries and patisseries. This may have sounded like a negative review. But overall it suited us very well. It wasn’t clear in the property listing but found it inconvenient and worth noting for others that the loft/second bedroom has the only entry door into the apartment so if people were sleeping it was hard to go in or out of the apartment. This apartment was clean, comfortable beds and pictures accurate. Good communication too. What I especially liked was the location. Walking distance to the Louvre and good neighborhood restaurants and stores. The apartment is on the second floor with steep, narrow stairs if that is an issue for anyone. The apartment was clean, neat, comfortable and conveniently located. Turn left and you're 5 min. away from the metro, turn right and you are a 5 minute walk from cafes, wine stores, pastry shops, grocery stores, cheese stores and fruit markets. The apartment is on a very quiet street with minimal car traffic. We would definitely return. My family of 6 (3 adults and 3 children) stayed in this apartment as an alternative to several hotel rooms. It was an excellent choice. A few blocks from metro stops, park, and dozens of restaurants, cafes, bars. A grocery just a few minutes walk made this a very convenient stay. We have been to Paris a few times and enjoyed being in a more local, residential area but if you want to be really close to major tourist attractions this is not where you want to be but it is not too far. It is about 20 minutes walk/metro or uber to each of them. Can't beat it for the size of the apartment and the price! Thanks for a great stay. +fully refundable security deposit of 400 euros not included in this quote. To be paid 10 days before your arrival. Please note that for reservations of the property taking place within a month we will require a photocopy of your ID.